Well folks, our foster superstar guest post series has come to a close. We are so proud to be among such great company on our fostering journey, and we hope that everyone enjoyed reading this thoughtful and diverse set of perspectives. To wrap it up, we thought it would be fair if we shared our own thoughts on fostering by completing the same interview – with ourselves – that we asked our peers to share over the past two weeks. 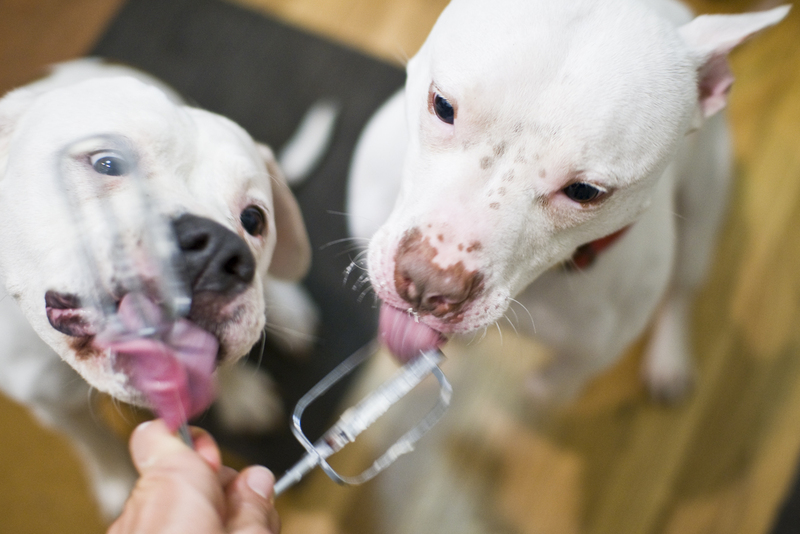 So here goes – our very own overly wordy and heavily commaed non-guest post about dog fostering! Why did you begin fostering dogs? It’s hard to cite one clear moment, idea, or experience that led us into the world of fostering. There are a lot of practical reasons that fostering seemed like the right choice: I have always envied multi-dog families, but our life’s instability (frequent moves, career uncertainty, obsession with travel) would have made it impractical to adopt a second dog. Fostering was a good way to enjoy the satisfaction of a multi-dog home without the decade-plus commitment. But the more significant reason was my love of the redemption narrative. I have a great appreciation for the classic story of underdog overcomes the odds and proves society wrong. I love these stories when they are about people, and I love them when they’re about animals. Bringing foster dogs into our home allows us to be a part of this narrative and witness the beautiful tale of redemption in our own home. Who was your first foster dog? Lollie Wonderdog was a perfect example of the redemption story. She was a three-year-old pit bull type dog who was found in a dumpster, skinny, filthy, and covered in bruises and scars. In the shelter, she didn’t seem to have much of a chance, and yet – she quickly made her way into the hearts of shelter workers and became a favorite. Her skinny physique and scarred face didn’t lead her immediately into the arms of a loving adopter though. She needed to come into our home, rest a while, and learn how to be a dog before her perfect family found her. I cried the day Lollie Wonderdog was adopted. I was sad to see her go, but more than this I was overwhelmed with the beautiful new trajectory of this brave and loving dog’s life – a trajectory that would not have been possible without foster care. Lollie – now Lily Fireworks – lives with a delightful family and two lovely children. She goes on hikes, bike rides, and adventures, and has already mastered basic training and is working on her PhD. Her mom, a Naval nurse, dreams of having Lily certified as a therapy dog so she can work with injured veterans returning from war. We all think that Lily could speak very powerfully to others who have been through hard times and have a long road ahead. What has kept you going? The need keeps us engaged, and the simple fact that we have the time and ability and we know it makes a world of difference for the dogs involved. But there’s more. For some people, fostering is addicting. I am one of those people. I am not sure which I love more: making a great match, or picking out and getting to know a new foster dog. 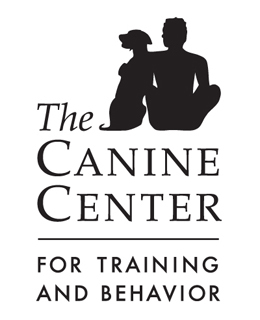 With each dog we successfully care for, we learn more about dog behavior, personalities, integration, etc. With each one, we feel more confident in our ability to give the dog what it needs and place it in an appropriate home. It’s a self-reinforcing loop. Why do you think fostering is important? Our guest bloggers over the past week and a half have already stated so eloquently why fostering is important, so there is little for me to elaborate on. We wrote a while back about all of the dogs who would not have had a chance without foster care, and we think these anecdotes speak better than any broad explanations ever could. What is the most rewarding part of fostering to you? An extra warm little body to snuggle and a new honey-brown set of eyes to look adoringly at us is a pretty big reward in itself. Other than the obvious benefit of caring for a precious life that may have otherwise met a sad end, we experience a thrill every time a new person tells us that our work and our dogs have made them confront their prior assumptions about pit bulls and dogs who look like them. Our foster dogs have changed minds – including the minds of some of the kind families who have adopted them or their sheltermates. There is no better reward to us than that. I have recently become self-conscious about sugar-coating the fostering experience. From time to time, I get an email from a big-hearted individual who feels all alone in the frustrating, scary, or hopeless situations they have found themselves in with a foster dog. It’s not all fun and sunshine — we have been there too. We once had to euthanize a foster dog due to troublesome behavioral and possible neurological issues. That was devastating. We once had a foster who was not compatible with our own Chick, and we had to live for months in a segregated house, swapping dogs back and forth using baby gates. This dog could not be left in our yard because of its tendency to scale the fence and run off after squirrels, so our Chick’s life quality diminished for the time that this foster was with us. These months were trying for all of us. We once had a foster who fit so seamlessly into our home and who our Chick adored with such intensity that we found ourselves questioning our decision to not adopt ourselves. That was heartbreaking as well. Our own Chick is not 100% awesome with other dogs, and introducing him to other dogs takes time, patience, and finesse. With almost every foster, we have lived for days or weeks in a state of constant vigilance, monitoring behavior like a hawk, using baby gates all day long, and slowly, slowly building a positive relationship. This is always exhausting and hard. Have you experienced any benefits that you hadn’t expected before you began? The community we have developed since we began fostering – both online through our blog and in person through our local rescues and shelters – has been indescribable. Working with dogs has allowed us to meet and make friends with people who we would not have met through other channels of our life, and we feel nourished by these relationships in a way that we had not expected. Keeping an online journal of our fostering experience – our blog – has been even more satisfying. The positive feedback that is so generously showered upon us by friends and strangers compels us to keep going and do more when we otherwise may not have had the strength. Inquiries from individuals who consider us to be knowledgeable give us little boosts of confidence when we are feeling uncertain. Generous advice from our own mentors and peers helps us always feel supported and loved. What advice do you have for individuals considering fostering for the first time? First, look honestly at your life and think about what you can handle – how much time do you have? How confident are you in your ability to work with different kinds of dogs with different types of needs? What sacrifices are you willing to make? What do you need out of this experience to feel the fulfillment that will feed your desire to do it again? There are no right answers to these questions, but taking on too much can be exhausting and discouraging, while taking on too little can feel boring and under-engaging. Second, take the time to get to know various shelters and rescue groups in your area, and find one that is compatible with your needs and abilities. If you are worried about money, find a group that will pay for food and basic supplies. If you are not confident of your training abilities, find a group that will hook you up with at trainer or take the time to match you with a dog who won’t be above your skill level. If you desperately want to take part in the final adoption decision, make sure the group you select will allow you to play a role. And third, consider who your support network will be. We have found ours through our fellow dog-fostering friends around the country and through our blog. Many people find theirs through their own rescue in their own town. Others yet find a network through other means. There is no right answer here either, but fostering is hard work, and trying to do it in isolation can be exhausting. You will be grateful for your peers and mentors, and you will cherish those relationships more than you realize. Who was your most memorable foster and why? Not too long ago, we pulled an overweight, elderly pit bull dog who had a serious neurological condition and was not socialized with other animals. Something about her sweet little face and her pathetic look of resignation in her kennel compelled us to bring Little Zee home despite (or perhaps due to) her poor odds. We thought it would take us months to get her adopted. Two weeks later, we had three strong applications for her adoption. This experience knocked us off our feet. We were tentatively confident about our ability to show Zee for the wonderful family pet she could be, but we thought that finding the family who would appreciate her qualities would be like finding a needle in a haystack. We braced ourselves for months or longer of fostering her. Boy, were we wrong. We vastly underestimated the appeal of a dog like Zee. She is an elderbull with a neuro condition and needs to be carried up and down stairs, sure. But she is also among the sweetest, cuddliest dogs we’ve ever come across with the softest fur, the most beautiful eyes, and the most vigorous passion for napping. Turns out a lot of people are looking for a dog like Zee. Many things about fostering Little Zee were memorable, but what we will always be thankful for is the powerful reminder she gave us that we should never underestimate a dog’s potential based on its stats. Dogs are amazing beings and will never cease to impress me. What is your favorite foster adoption story? When we found Little Zee a home, we were just three weeks away from our move across the country. We knew we couldn’t bring home a new foster until after we get settled in Austin. But the next day, I defiantly came home with Curious Georgia in the passenger seat of my car. It was crazy. But it was perfect. Georgia wasn’t doing well at the shelter, and even by taking her for just two weeks, we were buying her some time and opening up a spot for another shelter dog to go into foster care. What came next seemed like a perfectly orchestrated symphony: Curious Georgia and I went strolling in our neighborhood and ran into ML, one of the wonderful people who had initially been interested in Zee. ML and Georgia hit it off like I’ve never seen: within two minutes of meeting, Georgia was snuggled comfortably in ML’s lap, face pressing gently against ML’s shoulder. It was love. Foster dad and I watched in awe – fingers and toes crossed – while ML and her hunny sent love letters to Georgia, glided flawlessly through the application and adoption process, and charmed her socks off (and mine) at her home visit. Even their kitties approved. Just five days before we left for Texas, Georgia was adopted. I’ve heard a lot of great stories that illustrate why even a seemingly insignificant effort can make a world of difference. Stories are stories, but every time I look into Georgia’s honey eyes, I will be reminded of how big a difference just that little extra effort can make. You have such a way with words. And pictures! Hope you are settling into your home in Texas and start the fostering process soon. This series was so fun! I loved reading all the stories (including yours)! I don’t remember how I found you, but I’m so glad I did. Thanks to each and every foster family who takes in pitbull-type dogs and changes even one person’s opinion, not to mention the life of one beautiful dog. The notion of redemption for both dog and human is so very important. You *are* making a difference. Well now Im crying in the library! Not fair! 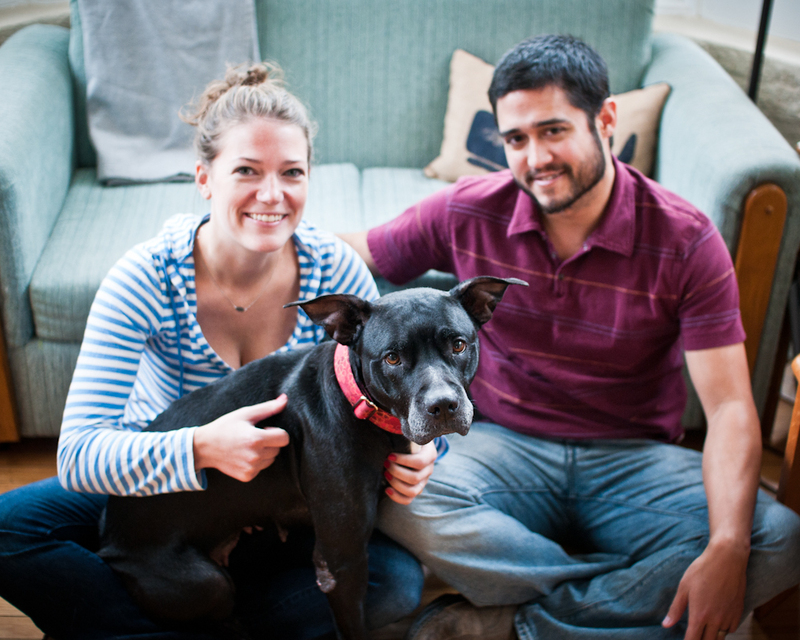 You are an inspiration Aleks, and I am so happy to “know” you and your pups through fostering. Hope the moves going well! I know Sir Chick is thrilled! You get to me every time! As I’m supposed to be taking a “foster break”, there are two pit mix girls in need who were rescued with ropes embedded in their necks! You make me want to say yes to everyone! I don’t have a ton of free time, but am willing to give up what I have to help save a life. My favorite part about fostering is getting the updates from the new families. Knowing I had a part in matching the pup up with the owners really makes me feel like I’ve saved a life! I honestly had no idea that Lollie and Chick had to be kept separated as much as they did. I’m assuming that is the fence scaler/squirrel chaser/separated pup you were talking about. On that note, you sure did a fantastic job even with that type of challenge! 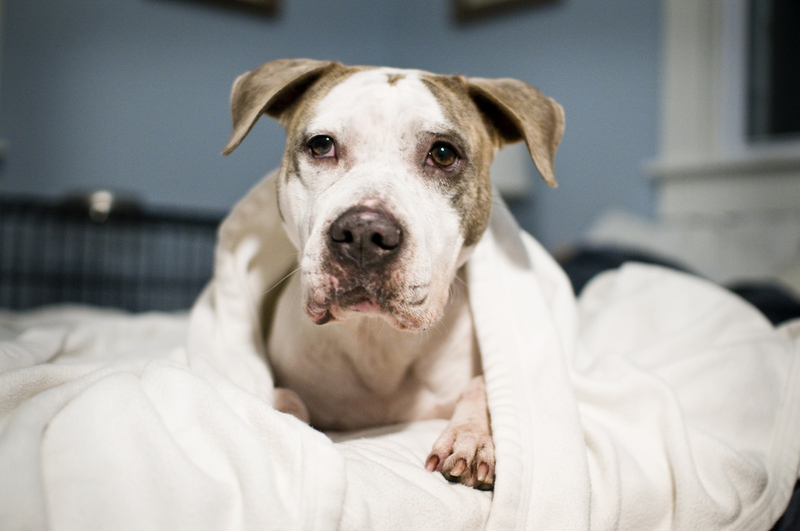 I need to do for hounds what you are doing for pibbles – let people know there is so much more to them than baying and rabbits/raccoons…for example: snoring, cuddling and floor cleaning. 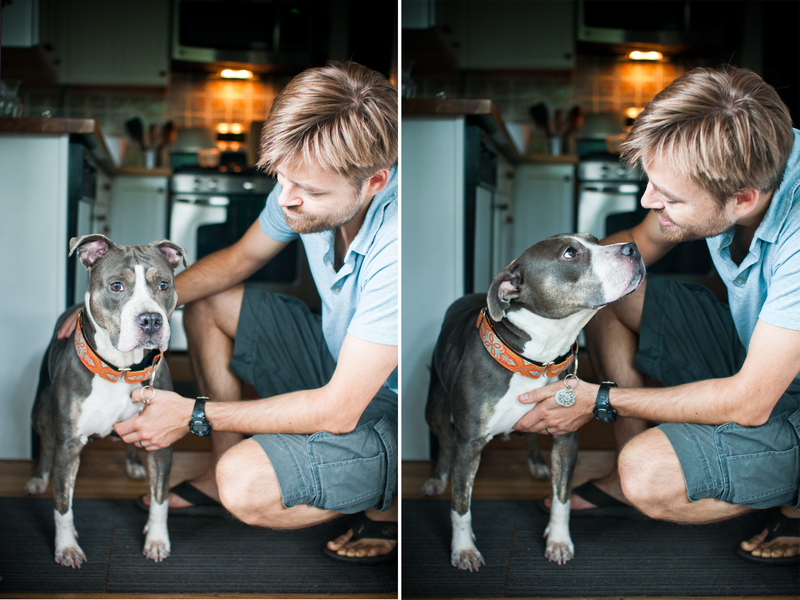 Thank you for sharing so well what you do as fosters and as a photographer – you are an inspiration to me as I try to get very good photos of my dogs :). Prayers for TX and so looking forward to your “new” blog from your new home. I loved seeing the whole guest series, and reading your responses as well. As often as I read your blog, there were still so many things we hadn’t realized. And you do have such a way with words. I loved your guest series, and I can’t wait to learn about your next foster. I’ve fallen for each and every pup you’ve taken in, and I’ll never forget the night that Scott came home to find me crying over my laptop when I read about Blue. Whenever I look at my photo of Little Zee I’m reminded of the generosity of this community and the power of redemption. Wonderful posts! You make me happy. That is all. You have been my inspiration from day one. I love your blog, your fosters and your lovely way with words. I hope to chat with you more once you get settled about getting our tiny rescue going :)- Also thank you so much for your very helpful email on fundraisers a couple weeks ago. Can’t wait to see how your life with fosters is in Texas. I’ve been on vacation and without a working computer for a little over a week and it was great for me to come back today and see this. I liked reading all of the other blog friends’ interviews and enjoy the trip down memory lane with all of your fosters too! I miss you! I miss you too Dave! may just anyone get that kind of info in such a perfect approach of writing?